When Penny Lane started The Lonely Hearts Club, the goal was simple: to show that girls didn’t need to define themselves by how guys looked at them, and didn’t have to value boyfriends over everything else. Penny thought she’d be an outcast for life . . . but then the club became far more popular than she ever imagined it would be. But what happens when the girl who never thought she’d date a good guy suddenly finds herself dating a great one? She doesn’t need a boyfriend . . . but she wants it to work out with this particular boyfriend. And he wants it to work out with her. Only, things keep getting in the way. Feelings keep getting hurt. Words keep getting misunderstood. EMME has long lived in her best friend Sophie's shadow. She writes songs, and Sophie sings them. It's always been like this, and feels like it always will be. SOPHIE will stop at nothing to be a star. Even if it means using her best friend and picking up a trophy boyfriend, Carter. CARTER is a victim of a particular Hollywood curse: He's a former child star. Now all he wants is a normal life. But being normal is about as hard for him as being famous. ETHAN has his own issues -- a darkness in his head that he just can't shake. He's managed to sabotage every relationship he's even been in. Emme's the only girl he's ever really respected... but he's not sure what to do about that. Emme, Sophie, Carter, and Ethan are all students at a performing arts high school, where talent is the normal and fame is the goal. But sometimes, being in the spotlight isn't as important as the people you're sharing it with -- as the four of them are going to find out in Take a Bow, which is about the auditions life puts us through every day, both big and small. 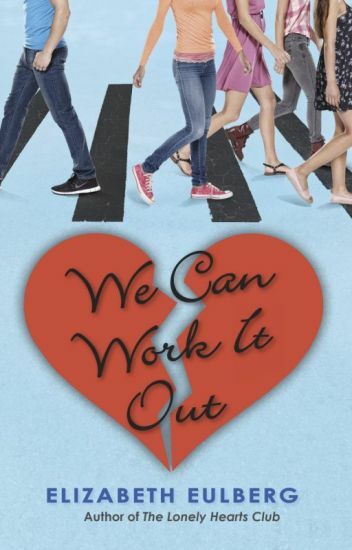 Can't wait to read We Can Work It Out? Return to the world of Penny Lane Bloom with three all new e-book short stories that pick up right where The Lonely Hearts Club left off! Don't miss all three e-shorts from romantic comedy superstar Elizabeth Eulberg. Each one contains a sneak peek at an excerpt from her return to the world of the LHC, We Can Work It Out! An extended Halloween scene from my novel, Better Off Friends! This book is full of fun Warrior Cat spoofs! This is my first story so I hope you like it! Penny Lane Bloom founded The Lonely Hearts Club, which means that she basically doesn't date. She's got her awesome girls to hang out with, she's got her hilarious (and sometimes annoying) family, she's working towards high grades to get into a great college - she'd never give up any of that to be with a boy. But (spoiler alert!) all of a sudden, the rules of the Club have changed and Penny's not only allowed to date - she's going out with Ryan Bauer, longtime friend, all-around amazing guy, and her best friend Diane's ex-boyfriend. It's not like Penny hasn't been on plenty of first dates before, and it's not like she hasn't seen Ryan practically every day for years . . . so could someone please let the butterflies in her stomach know it's okay to calm down? Four months later, everything has changed. Penny's gone from a few friends to a huge group of girls who all have each other's backs, from a guy who thought nothing of cheating to a total sweetheart, and from the idea for The Lonely Hearts Club to a full-scale girls-rock revolution. Just think how much more she'll be able to accomplish by the end of the school year! And it's the holidays, which means Penny has two blissful weeks to spend eating cheese fries with her girls and kissing Ryan. The only thing she still has to do is survive Christmas with her family. Eventually they realize they're best friends - which wouldn't be so bad if they didn't keep getting in each other's way. Guys won't ask Macallan out because they think she's with Levi, and Levi spends too much time joking around with Macallan, and maybe not enough time with his date. They can't help but wonder . . . are they more than friends or are they better off without making it even more complicated? Everybody loves Lexi. She's popular, smart, funny...but she's never been one of those girls, the pretty ones who get all the attention from guys. And on top of that, her seven-year-old sister, Mackenzie, is a terror in a tiara, part of a pageant scene where she gets praised for her beauty (with the help of fake hair and tons of make-up). The time has come for Lexi to step out from the sidelines. Girls without great personalities aren't going to know what hit them. Because Lexi's going to play the beauty game--and she's in it to win it. Love is all you need...or is it? Penny is sick of boys and sick of dating, so she vows: No more. She's had one too many bad dates, and has been hurt by one too many bad boys. It's a personal choice...and soon everybody wants to know about it. It seems that Penny's not the only girl who's tired of the way girls change themselves (most of the time for the worse) in order to get their guys...or the way their guys don't really care about them.